After their capture of Constantinople in 1453, the Ottoman Turks continued their westward expansion for another 200 years. All the territories of Venice's empire in the Eastern Mediterranean lay in their path. Losses at first were relatively small. 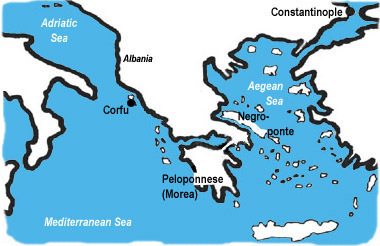 The Turks seized Argos in 1462, Corinth in 1464. Next, however, came the shattering loss of Venice's great colony at Negroponte in 1470. Finally, Venice agreed to a demeaning peace with the Turks. The price: loss of her territories on the Greek mainland and in Albania as well. Peace proved to be not much better than war. Turkish pirates, operating from their new safehavens at the mouth of the Adriatic, began raiding Venetian port towns all the way up to the Istrian peninsula. Actual warfare erupted again from 1499 to 1503; Venice's losses this time were limited to Lepanto and its other remaining enclaves on the Peloponnese coast. As always, peace with the Turks was transitory. War followed again from 1537 to 1540, with the Sultan gathering into his domain a string of Venetian island possessions across the Aegean Sea and along the coast of the Peloponnese. Only a surprisingly successful defense of Corfu at the foot of the Adriatic gave the Venetians any comfort. In the usual pattern, a demoralizing peace treaty ensued. By 1570 the Turks were ready to assault one of Venice's most valuable possessions, the island of Cyprus.